When I leave from certain airports or land in others, my thoughts are often diverted to memories of my grandfather. The two airports are that of Dubai and that of Salt Lake City, Utah. Dubai International Airport has grown exponentially since the seventies, when my Jeddo ( a Lebanese title I gave my Iranian grandfather) used to await us or drop us off at the airport. He lived in the United Arab Emirates from the late 60s till the late 1970s, paving the way there for us by building his vision: hospitals and clinics for the Emirati nation. The Iranian hospital in Dubai and the one in Fujeirah were his creations. Upon arrival, I would look for his white hair. His large smile. His pin striped suit that was elegant and appropriate for Dubai's warm climate. I cannot remember whether he waved from a balcony or greeted us on the tarmac. At the time, the Dubai airport was so small that both are possible options. I distinctly remember the only airport hall, where you took a right for departures and a left for arrivals. The white hall, with large orientalist beams and high windows, still stands today, as the international departure hall. When we departed and we bid him farewell, the only consolation was that we were allowed to run down the swerving descent toward the tarmac, leading to the MEA flight that took us back to Beyrouth. 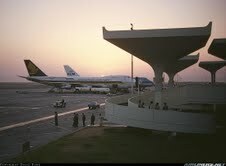 There is a little incident that once occured at that airport, which my Jeddo always remembered vividly. I was reminded of it countless times by him, be it casually or even once ceremoniously at the speech he made at my wedding. My parents had traveled leaving me with my grandparents in Dubai. Jeddo drove me to the airport to welcome them. I was so eager to see them that, the silver Mercedes barely coming to a halt, I opened the back door, ready to leap to the side walk. His paternal anger, a product of fear and love, resurfaced, and he gave me a spanking he remembered! The interesting part is that I don't particularly remember it. Apparently, it was the first and last kotak (spanking) I'd received from him. There is another anecdote which deserves to be recounted here, although it has nothing to do with airports, but instead took place at the Chinese restaurant in Dubai. My grandparents took all the members of their family who were residing in Dubai at the time, out for dinner. I sat with my youngest aunt and uncle at a table, while the adults sat together. Having finished the main meal, and looking forward to the vanilla ice cream I had ordered, I went to wash my hands. When I returned, I was stunned to find some "strawberry sauce" on my ice cream. My aunt and uncle, who were only seven and eleven years my senior, encouraged me to eat the vanilla ice cream that they had actually covered in tobasco sauce. As I was willing to believe anything they told me, I took a large spoonful of the concoction. My mouth was immediately on fire and to the rescue came my grandfather. This time, my aunt and uncle received the spanking they deserved. Eventually my grandparents moved back to the States. In Salt Lake City, at the arrival gate, once again it was my grandfather's white hair, large smile and chinos that I saw from afar. He had retired by this point and no longer needed to wear a formal pin striped suit. I continued to visit him with my family for summer breaks and Christmas, as I got older, continued to visit every Thanksgiving, by myself, when I was in university. In his late seventies, Jeddo still had the strength and the stamina of the Dubai days, probably because he enjoyed his Utah lifestyle so much. He would wait for me, his arms wide open, carrying his cherished New York Times which he refused to subscribe to, for his love to go buy it daily. His pockets were full of restaurant napkins and mints and he would always suggest a stop at the Red Lobster, a chain of restaurants, only he appreciated. I would then suggest Jamba juice, at which he would mumble a "muzakhraf!" (nonsense), but would take me there despite himself. If there was snow, he was the one who drove me to Snowbird as he wanted to haggle at the ski rental stores. His charm and wit always got me a small discount and the best service. If there wasn't snow we spent quality time, driving, talking, walking in Pepperwood, the gated community he lived in. I made two academic trips to Utah. He reviewed my whole Persian literature program with me. I always knew he would make the best Farsi tutor. He abided by my strict study regiment and while he loved the poetry of Saadi, he hated the modern literature, such as My Uncle Napoleon, which he read with me and once again called "muzakhraf" (nonsense). I recently was in transit at the Salt Lake City airport, on my way to Wyoming. 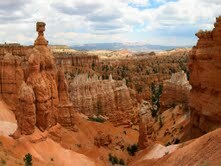 I remembered the halls with the paintings of canyons, American Indians and the photographs of the Utah wild flowers. I walked past the shoeshine stalls where often he would regret not having worn his dressy shoes to get them shined. I saw the hot dog stands where he would stop to energize, and where my son, named after him, begged me to get him his favorite American treat. I went through luggage security, where they would open his bags full of medicine, to which he would respond : "But I am a physician!" I felt his presence everywhere and missed him very much. Reading this entry made me miss Jeddo Abu Torab so much! Though I was too young to remember him waiting for us at the airport in Dubai, I cherish the memories of him waiting for us at the gate in Salt Lake City. I miss his white hair and his warm smile. Our children are so lucky to have Jeddo Saad and Teta Shahnaz waiting for us at the airports in Nice and Dubai. They will also cherish these memories. Thank you for writing this entry about Jeddo Abu Torab. It brought back alot of beautiful memories! Linking airports to people is an ingenious way of making it difficult for us to comment,especially that the subject matter is so dear to my heart. As a matter of fact I met Jiddo the first time at the arrival door of Mehraabad airport in Tehran in summer 68!I was impressed that the airport's name and the family name were one!I don't think Jiddo's appearance did change much since I met him first,from the time the blogger remembered him at Dubai or Salt Lake City airports!He was the ever handsome,glowing,self-assuring figure of a family patriarch that he was. The second station in our life linking us together was at the Dubai airport in 1972 when destiny brought us to settle in Dubai away from the land of the Cedars.It was Jiddo,his hospitality,encouragement,backing that made to this date,the fourth generation of our family consider Dubai as their home.His love for Dubai and his admiration for the wisdom of its late Ruler Sheik Rashid,encouraged us to remain there.Even after he left for the US in the late 70s,he kept on visiting us and encourage us to persevere in our life there. It was the SLC airport that became our destination of almost 20 years,where we have rich memories of exposure to the American life at it's purest and its best.Our fourth child was born there along with several of his cousins,since the family followed Jiddo's steps and resided for a time facing the lovely mountains of Utah. It is said that life is a trip where you stop and land at different airports,and those were our main stops with the man we all cherished and loved! He was a grand and larger than life figure. His love for Iran (he loved Afghanistan as well, having donated a whole medical library to a university there), his love for life made us all enjoy his company, his sense humor, his grand vision, his acceptance of diversity in people and ideas meant he was ahead of times. We got along from the first moment we met and it was without hesitation and indeed a great honor that we named our first son after him. We have AT in front of our eyes everyday. This post was an emotional one for all of us, and I am sure for any reader who may have lost their grandfather at some point in time. I miss Jeddo also, and think of him often and at random times, like when I rub vicks on my children when they are sick, reminding me of his clean smell that always had vicks or tiger balm scent mixed with it. He taught me how to ski and gave me confidence to enjoy nature, waterfalls and hiking. He used to speak at length of Persian ancient stories, most of which I didn't understand, and I would laugh with him. He gave the best hugs, and tickled us with kisses inside our ears. We always loved his "ghabghabou", the softness that had grown with time under his neck and we would kiss him there as kids. We all miss him dearly, from Dubai, to San Diego, to San Francisco and New York. He attended all our graduations, so proud was he of his tribe. He was a family man, and a wonderful doctor, an intellectual who taught himself languages, and a man of adventure. Upon the insistence of the blogger (and she REALLY REALLY INSISTED), I am including here a poem I wrote after he passed. I hope it won't revive too many sad feelings, but instead will bring back those memories of him that we like to keep in our hearts and minds. Thank you for the post Yasmine, it was refreshing to read. As I read, it sparked a lot of great memories from my day's in Utah with him. Tears came into my eyes when I read your memories of airports. Yes, he was a great man who touched many lives. Even though he was busy he put aside time to spend with his wife, his 10 children, son in laws and grandchildren. Speaking about your experience with him brought up a memory for me that somehow involved Dubai airport and his special attention to my daughter. What a great post and what great memories! Here is one of many memories I have of Daddy Torab. A few years after Behnam and I had gotten married and before the three kids came along, Behnam and I decided to take a last minute trip to Barcelona. As we were walking down a steet in Barcelona, I heard someone calling my name. For a second I thought I was imagining it but when I saw the look on Behnam's face, I knew it was not an auditory hallucination. I saw the blogger running towards me with her parents and my grand parents following. The blogger and her family had decided to take a weekend trip to Barcelona and it just happened that we were there as well. Needless to say, our plans changed and we decided to join them in France for the remainder of our trip. The night before our drive to France, the blogger, Behnam, and I decided to go out for some sushi. The next day in the car, I was extremely sick and throwing up. The bloggers parents were besides themselves with joy because they were convinced I was pregnant!!! We stopped at one of the rest areas off the highway and my grandfather came to the passenger side of the car where I was sitting to see how I was doing. He reached into his pocket and pulled out a wad of tissues (thank God I didn't have a runny nose! ), which he always had in his pockets. Embedded somewhere in the bottom of his pant pocket, he pulled out a pink pill which he blew on and wiped off and told me to take. He then proceeded to go through his "medicine bag" and out from the bottom somewhere, pulled out another pill wich again he wiped off and handed to me. He insisted I take both pills eventhough I was arguing with him about not wanting to take anything in case the blogger's parents were right. As my grandfather walked away, I threw both pills under the car. He returned and was standing on the driver's side of the car, to ask if I had taken the pills. I assured him I had and that I was sure I was going to feel better in no time. Just as he was about to leave, to go to his car, he looked down and saw the two pills right by his feet! He reached down, picked them up and asked me what these were??? I was speechless and he was upset, calling me "pedar sookteh". So he just wiped off the pills and threw them in his "medicine bag" for the next time someone needed a remedy.